As usual, problems are waiting to happen. Download https://github.com/downloads/libevent/libevent/libevent-2.0.21-stable.tar.gz and unpack it. You don’t have to build this, it is only used by gevent in the build process. 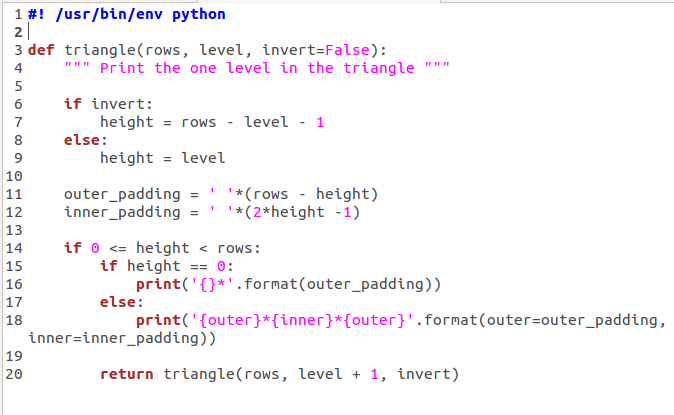 pip install gevent --install-option="--libevent path\to\libevent\source"
Through this series of blogs, I want to record my pythonic adventures and refactor my existing code to reflect my new skills. 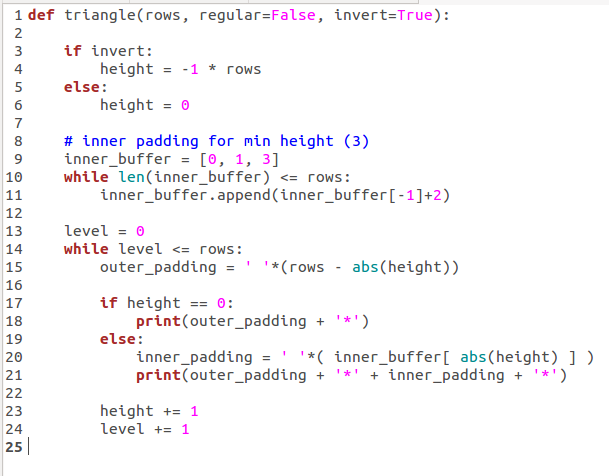 In the Triangle Project, I must develop some code to print the outline of a triangle. The triangle must be able to be printed either upright, or upside down. Hacking it up: above is my first attempt to hack this up. It is quick and dirty, but does the job. Below, you will see my first attempt to refactor it using recursion. To be honest, using a recursive function does not actually make any difference to this program. It is not any more elegant or abstracted than a simple for loop could achieve. However, the script is about 20% shorter. I was looking through the videos for PyCon 2013 and there was a talk on Dynamic Code Patterns that caught my attention – because I don’t know what they are. I love the idea of loading plugins but have no idea how to write code that would allow for it. So, without watching the video yet, I took a shot at trying to write some code. I started at David Janes’ Code Weblog to learn how to dynamically load code. I took his function for my code. Sometimes in life you find yourself wanting to have a quiet afternoon in front of a computer, extracting login credentials and SQL commands from captured MS-SQL TCP connections. Other times you may find yourself needing to do so to analyse some MS-SQL attacks. Whatever your reason, this post explains how to use my parsetds.py script to extract such information. Here is another interesting article about the difference between Product Manager and Project Manager. In some companies, Project Managers are known as Program Manager. I also know of one company that merge the two functions into the Product Manager role. Product management vs. Project management : How To Be A Good Product Manager: Product management tips. : A Project work that delivers the desired result depends on the quality and efficiency of the raw materials supplied by the vendors. He cannot afford to shun away quality vendors just because they charge more than the others. This type of approach backfires most of time as the raw materials used for the project work are of inferior quality. He may be reluctant to go for the expensive vendors who would provide better quality of raw materials because it would exceed his budget. But it is advisable for the project manager to consider all factors before initiating a contract with the vendor.